Peter Biggs of The Light Magazine is researching one Metro Vancouver / Fraser Valley municipality each month, and producing a four page feature. The September issue features Surrey. The Semiahmoo, Katzie and Kwantlen First Nations People have lived in the region for thousands of years. Incorporated in 1879, Surrey officially became a city in 1993. The two-lane Pattullo Bridge linking New Westminster and Surrey was opened 1937. The old Port Mann Bridge opened on June 12, 1964, originally carrying four lanes, and was replaced by the present 10 lane new bridge, as part of the $3 billion Gateway Program in 2012. Surrey is the province’s third largest city by area (after Abbotsford and Prince George), and the second largest city by population after Vancouver. The City of Surrey is composed of six town centres: Fleetwood, Whalley / City Centre, Guildford, Newton, Cloverdale and South Surrey. The 2011 census found that English was spoken as mother tongue by 51.72 percent of the population; the next most common language was Punjabi, spoken by 20.17 percent of the population. Visible minorities make up 53.6 percent of the population, with 30.7 percent being South Asian. Surrey witnessed unprecedented population growth during the 1980s and 1990s. It is currently projected to increase by 300,000 people in the next three decades, surpassing the city of Vancouver as the most populous city in BC by 2041. The 2016 Census recorded Surrey’s population increasing by 10.6 percent since 2011 to 517,887. To compare, Langley’s population increased by 12.6 percent and Coquitlam’s by 9.8 percent, while BC’s population grew by 5.6 percent and Canada’s by 5 percent. The 2011 National Household Survey states, “The most frequently reported religious affiliation in Surrey was Sikh, reported by 104,720 – 22.6 percent of the population. Other frequently reported religions include Roman Catholic (13.8 percent) and other Christian denominations (7.6 percent). Provincially, Roman Catholics make up 15 percent of the population, and other Christian denominations 7.2 percent. Roughly half the homeless in the area live in makeshift tents along this stretch of sidewalk. Largely hidden from view, behind stores on King George Boulevard and 108 Street in Whalley, is the infamous ‘Strip’ on 135A Street. Walking along the two blocks from 108 to 106 Avenue can be harrowing. The entire length of the sidewalk is packed with makeshift tents and shelters. Around 100 homeless people live there. Drug use is rampant and it does not take much discernment to see the brokenness and squalour caused by untreated mental illnesses. For basic hygiene reasons the city power-washes the sidewalk weekly, a routine inhabitants have become accustomed to – moving their tents aside. There are three vandalized and defaced portable toilets. The Strip has only grown in the last couple of years. The RCMP have a dedicated 12 member squad and portable office on The Strip. Members walk The Strip in pairs. It is obviously a tough assignment. They rotate out after three to four months. The Light visited two prominent Christian ministries which work with the homeless on The Strip. 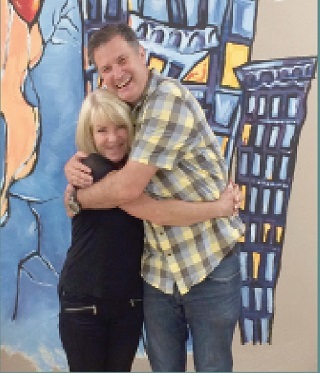 Surrey Urban Mission (SUM) – headed by Mike Musgrove and, just 2 blocks down from them, NightShift Street Ministries, headed by MaryAnne Conner. They nicely complement each other with the different services they offer. Connor and Musgrove both encounter crushing brokenness in people daily, but share a common vision and faith for people to find hope and lasting change through Jesus. MaryAnne Connor and Mike Musgrove work together on The Strip. Surrey Urban Mission (SUM) occupies an old bowling alley storefront on King George. SUM provides breakfasts for 90 – 140 (partnering with Rick’s Heart Foundation), lunches for 120 – 200 Monday to Friday, and dinners. Nightshift workers go out daily with their large Care Bus. Volunteers bring sandwiches and soup and offer counselling services and prayer. “We circulate The Strip with a clip-board and get ‘prayer requests’. We then take them and volunteers form a visible Prayer Circle on the street and pray,” Mary Ann says. “It’s about more than just serving soup. We see a ‘continuum of care’ involving outreach, counselling, education and transitional housing.” Nightshift offers an extensive Volunteer training course they call ‘FORGE’ with Doctors, addiction specialists…etc coming to teach; and have started ‘Forge Youth’ training for 13 -18 year olds. . . . Some of the women – mostly refugees – who have come to faith in Jesus. Peoples Church is strategically placed in an area of Guilford that has a community of Arabic speaking immigrants, including large numbers of recent refugees from Iraq and Syria. Amal Alexan is an Egyptian Christian who works with refugee women. She has led numbers of Middle Eastern women to faith in Christ since 2000. “I visit a lot of women in their homes and have a weekly meeting at People’s Church. Women bring their friends and we have 30 – 40 come each week,” she says. Alexan spoke of one call she had out of the blue from a very fundamentalist Muslim. Cloverdale pastors . . . Surge! Dave Groen, associate pastor at Hope Community Church, originally introduced the idea to other Cloverdale pastors. “I heard of it from my father-in-law Mike Goheen who taught it at Seminary in Phoenix, Arizona,” he says. Surge has had over 1,000 pastors complete it (mainly from Arizona) – Cloverdale is the first Canadian one. • First it focuses on the Gospel story and finding your place in the drama of the biblical narrative. The macro view of God’s big story. • Secondly there is a focus on the application of the Gospel to our hearts and lives as the Holy Spirit continues to shape our thinking, attitude and actions through His Word. • Thirdly is the development of a view of the larger purpose of God’s People in the mission that God has given to disciples for as long as we have breath in our lungs. • Lastly, is an examination of the Kingdom value of our vocation. This last section will help us to develop an understanding of our calling as Christ-centered people working in various locations and vocations. These Cloverdale pastors & Leaders met weekly, at tables of 8 – 10. “There was homework and our sharing became very real, challenging and important,” Groen says. Asked why already busy pastors would sign up, to an intense course like this, Groen says, “We all knew we needed to be intentional about making disciples, but also knew we weren’t necessarily doing it.” Surge requires that pastors have to complete the program before it is introduced into their churches. . . .
Dean Cooper is a pastor at Peace Portal Alliance Church. He created a survey that he sent to 18 Surrey churches to enquire what ministries/services they provided for the community. “The churches were chosen both geographically (from each of Surrey’s communities) and for being known as open to inter-church collaboration,” he says. The results made up a report that contained an impressive list of ‘good works’. These 18 churches represent about 15,000 attendees and documented nearly 2,000 volunteers serving over 20,000 people in their communities in such areas as: immigrant services and ESL classes, services to the poor and homeless, extreme weather shelters, support and mentoring of people with addictions, reintegrating ex-prisoners into the community, and school adoption including hot meal programs. She spoke of young people, gangs and a number of other social challenges. She in turn asked, ‘How can I let the community know what the church is doing to serve our community?’ The average person has no idea what the church does, and with our poor record of working together as churches how would they find out? When looking at the ‘big picture’ in a city or region, two factors that come to the fore are homelessness / social needs and seniors. Demographically it is well known that the proportion of seniors in the population is significantly increasing (along with associated health care needs). Amongst Surrey’s resources addressing the need of aging seniors is the large Elim Village campus, with its 300-plus residential units. . . .
Five years ago, Surrey Christian School grade 7 teacher (now elementary school principal) Danny Nagtegaal had the idea of reaching out to his neighbour – in this case the nearby Sikh Academy. He sent his fellow grade 7 teacher there a simple email. Robbie Purewall, also a vice principal, is around the same age, and responded warmly. One thing led to another and they started to explore friendship and ways their students would benefit by meeting each other. “We wanted our kids to understand more of what’s it like to be a 12 year old Christian or Sikh kid living in Surrey.” Nagtegaal says. Purewall adds, “Neither of us want our kids growing up in a ‘bubble’.” Purewall invited Nagtegaal and his class over. “They were super hospitable,” Nagtegaal says. Students were paired up and given tours of the Sikh Academy, then lunch. After lunch some played soccer, while others informally socialized. Since that time, Surrey Christian School superintendent Dave Loewen and Sikh Academy principal Baldeep Hehar have enjoyed numerous lunches with Nagtegaal and Purewall. Warm and genuine friendship has grown. “The four of us are in touch at least monthly,” Nagtegaal says. The Sikh Academy was only started in 2009 – with 16 kids. “We grew so quickly, (we’re now around 700). Surrey Christian were there to help us deal with this rapid growth at many levels,” says Purewall. There are now numerous connections between the schools, all teachers even sharing a ‘Pro D’ day. Teachers from other grades now get together for ‘buddy classes,’ along with occasional field trips. The school has now grown to over 1,000 pupils (pre-school – grade 12). Like PA, they seek to have students serve the community. “One example is our IT class,” Clara Atagi says. “New immigrants are invited into our computer lab. Three teachers and volunteer students teach them necessary computer skills. Our grade 11 and 12 IT students have built websites for non-profit organizations,” she says. Offering pre-school to Grade 12, Holy Cross Catholic School has around 800 students. Their school motto is in hoc signo vinces, reflecting their belief that with Christ’s help we can conquer any obstacles. They encourage students to become socially aware and productive members of society, who will model the Christian values that they have learned during their time at Holy Cross. Along with three separate schools (elementary, middle and high) each year Regent Christian Academy welcomes over 100 international students and offers intensive ESL. As in other Christian schools, right from kindergarten and continuing to grade 12, Regent students are taught to care for those less fortunate, with a variety of opportunities to share the love of Jesus in tangible and meaningful ways. Cloverdale Christian School has approximately 200 students from pre-school to grade 7. Started in 1959 ,it was an extension of Zion Lutheran Church. They welcome students from all denominations, with many going on to high school at Surrey Christian School. Go here for The Light’s complete Surrey profile. ← Marijuana can offer comfort – what do we offer? Thank you so much for sharing this really thorough profile with us! Such valuable information for those of us who want to love and support churches and ministries in Surrey! I, too, would like to commend Peter Biggs for his thorough research and perceptive analysis of the city of Surrey and its Christian community. That said, I would like to add some further thoughts from the place where Edna and I are living in retirement, in the middle of the burgeoning south-of-Fraser urban centre contemporarily known at Central City and historically described as Whalley. I would take gentle issue with the quoted Globe and Mail reference to an alleged ‘stall’ in Central City’s 30-year-long redevelopment activity. From our living room window, we can see SkyTrain skitting in and out of Surrey Central station, which is presently undergoing a $25 million expansion. From right to left, we note the iconic Central City office tower topping the Simon Fraser University galleried Surrey campus and Central City Shopping Centre, the half-completed $135 million Simon Fraser School of Environmental Engineering and Sustainable Energy and Prime on the Plaza condo tower. Next is the (so far) tallest south-of-Fraser complex, the 56-storey 3 Civic Plaza, adjacent to the massive new City Hall and Central Library. 3 Civic Plaza, a hotel-condo-university project will open later this year. Next comes 36-storey Ultra tower which was under construction when we moved back to Surrey from an Ottawa stay of 15 years, four years ago. Then (and this one is kind of special, from the faith perspective) comes Alumni, a Bosa condo project built on land where Christ the King Lutheran Church sat since 1957. The Bosa church arrangement included a new church at the foot of the tower and a seven-figure contribution to Surrey Urban Mission (SUM Place) for purchase of the former bowling alley that now serves the ministry’s work with homeless people that populate the area. 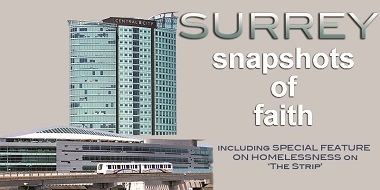 SUM Place and Night Shift, the two major faith-based mission projects, serves the area in and around the “Strip”. The completion of our living room scenario is Evolve, a condo tower by WestStone, which is also doing an innovative residential and health care project across the street from Surrey Memorial Hospital in a former trailer park. Evolve is half completed and sits between Ultra and the Wave, a condo project opened four years ago. Then there are numerous low rise residential project surrounding these towers, like the appropriately-named Ethical Gardens, where we live and where I am honoured to serve as the strata chair. Inspired by the Los Angeles Dream Centre – a former Catholic Hospital that was taken over in the 90s by a Pentecostal group headed by Matthew Barnett – that multi-faceted project has helped reduce crime, addiction and mental health issues by a reported 75 per cent since its inception. The Surrey Dream Centre, initiated by Relate Church, has been receiving supportive buy-in from 15 of Surrey’s largest churches and many in the civic and health care leadership of the city who have wondered how the Christian community might help resolve some of the community’s social stresses. Among other things, it will involve the raising, conservatively speaking, of about $50 million over the next few years. There are at least 15 other major Central City urban development projects on the launch pad or in advanced planning or approval stages. Many involve health care, education, residential, business and community issues. All provide areas for Christian people to provide their perspective and prayerful competence. There is not much “stall” here, even though it will take at least another 15 years, to see the vision fully play out.